Sarap Kumain with C2 Promo ~ Philippine Freebies, Promos, Contests and MORE! Mas napapasarap ang pagkain ng buong barkada lalo na pag may C2 na kasama! 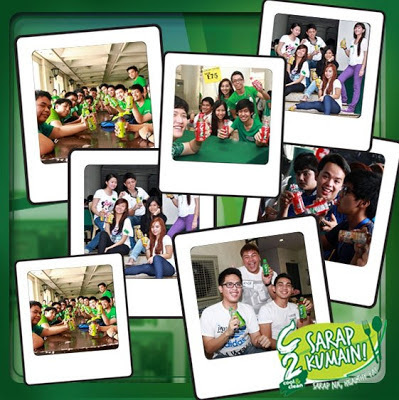 Make it more exciting and fun by taking a group photo of you and your friends and joining the Sarap Kumain with C2 Promo. It's so easy. First, be a fan of C2 Cool and Clean FB fanpage. Share and tag at least 15 of your FB friends and upload your entry upon completion of the registration form. That's it! Online voters can also earn raffle entry by voting their favorite photo. Fifteen (15) photo uploaders will win P10,000, P7,000, P5,000 and P3,000 worth of Sodexo GCs + cases of C2 1.5L Apple. Five (5) Voter's Choice will take home P3,000 worth of Sodexo GCs + 1 case of C2 1.5L Apple and ten (10) voters will be lucky to receive three (3) cases of C2 1.5L Apple each. You may submit as many photos as you want for more chances of winning.